Have a great new year, ED!! I don’t know if we have boardwalks in the UK! It’s not a word I knew before I encountered blogging. But another lovely peaceful shot. If you don’t reappear before HNY. I think ‘boardwalk’ is a American concept, maybe? It’s a long boardwalk, and a beautiful spot. I have missed you. Lovely photo. Glad to be back. It looks very calm and serene there, very nice! I always though a boardwalk was an American word, perhaps because of the Drifters song. So Australia have them too. 🙂 It still amazes me the things I’ve learnt since blogging. As roughseas has said, I’d never heard of them in the UK either. Thank you. It is a lovely place, and even cloudy, a beautiful day and perfect for a stroll along a boardwalk, by the the sea! A picture to meditate on! I was expecting something a little more board-like. Instead, I received this pleasant surprise. Very nice, EllaDee. Yes, misleading… this one doesn’t actually have boards, but it is an interesting walk, and we saw lots of fish in the water. Mountains and water. Sigh. What a lovely spot to wander. Now I won’t be able to get that song out of my head, haha, great image, looks very peaceful. Locals sometimes refer to it as the Foot bridge to the beach .. lovely blog! Thank you – I think foot bridge the more commonly used term in general… and what I would call is as well but I guess technically it’s a walk made of boards… Boardwalk has an American connotation. 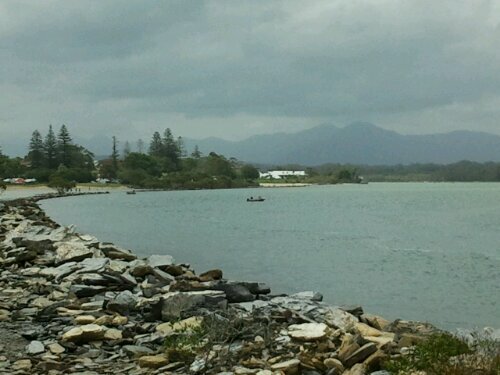 Urunga is a lovely spot. We always enjoy a nice lunch at the pub and a wander.